Opinions are divided about what exactly the Aam Aadmi Party represents, but one thing on which everyone agrees is that it's a game-changer in Indian politics. Arvind Kejriwal, its leader, is the visible mascot of that change, an ordinary man with a scruffy muffler, not unlike any of the people one might meet on a crowded city bus, men and women nursing a sense of frustration and betrayal towards a political class that has grown increasingly distant and corrupt. Robert Vadra, the son-in-law of Congress president Sonia Gandhi, calls them the 'mango people', punning on 'aam', the Hindi word for the fruit, which also means 'common'. Vadra, whose assets have ballooned in the past few years through a succession of sweetheart land deals, used the phrase at a particularly infelicitous time for India's ruling party, when its government was being buffeted by allegations of corruption amounting to billions of dollars. As the general election nears, it is evident the joke might be on him. Confounding pollsters, Kejriwal's AAP helped dislodge the Congress in regional elections in Delhi last December and has emerged as a credible player at the national level as India moves towards a general election in April and May. Indian politics has seen the spectacular rise of parties in the past but what makes the AAP different is the span of its geographical and political reach. It is neither regional like N.T. Rama Rao's Telugu Desam Party, which stormed to power in Andhra Pradesh in 1993 less than a year after it was founded, nor sectional, like the Bahujan Samaj Party that grew rapidly with the support of Dalits in Uttar Pradesh. The AAP's origins lie in a single issue that troubles all Indians, whether poor, middle class or wealthy -- corruption. And the party's leadership has broadened the ambit of this issue by focusing on the wider set of factors that have led to money-making and rent-seeking on a colossal scale. Kejriwal has made the link between crony capitalism and institutional reform, pushing for structural changes and transparency in public institutions, especially those dealing with law enforcement. Of course, the party's ability to push through the kind of changes it envisages remains largely untested. The short-lived provincial government AAP ran in Delhi began decisively with the implementation of populist promises to provide cheap water and electricity. However, Kejriwal and his colleagues were unable to contain the irrational exuberance of their supporters and found themselves pushed into a series of misadventures against the police. Though vibrant AAP units have sprouted all across India, the rapid spread of the party poses a challenge for its leadership: how to stay on message while maintaining its image as a vehicle for 'clean' people to involve themselves in politics. This is where the party's strength, its ability to attract people with a diverse set of concerns, is a source of potential weakness. The truth is that there is no ideological cohesion and it is very difficult to define what the party stands for except in tautological terms. 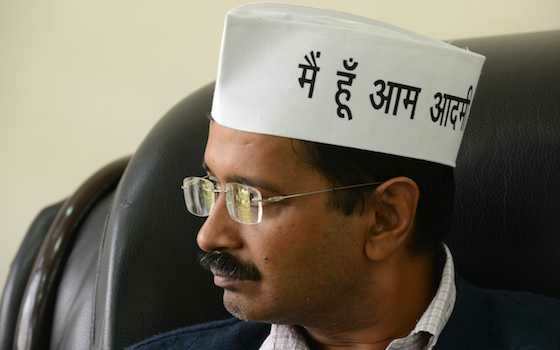 Kejriwal has gone out of his way to avoid the party being labelled left wing or right wing. Another AAP leader, the political scientist Yogendra Yadav, has spoken of 'post-ideological politics', a phrase that has made India's traditional Left wary. In reality, the AAP appears consciously to be embracing the rhetoric -- if not the actual platform -- of the Left in its effort to portray both the Congress and its right-wing challenger, the Bharatiya Janata Party, as apologists for big business. The party speaks the language of rights and appears as opposed to the Hindu chauvinist worldview of the BJP and its ideological patron, the Rashtriya Swayamsevak Sangh, as the Communists are. During AAP's brief 49-day rule in Delhi -- Kejriwal was Chief Minister of the citystate with Congress support -- the party took on two private power companies that sought higher electricity tariffs but refused to allow their accounts to be audited. Shortly before his tactical resignation as Chief Minister, Kejriwal launched a broadside against India's biggest industrialist, Mukesh Ambani, going so far as to register a criminal complaint against him and central government ministers for allegedly manipulating the price of natural gas. In targeting the cronyism that masquerades as politics and private enterprise in India, the AAP has tapped into a wellspring of public support. But it also places the party in the sights of some of the country's biggest business houses. The reason is not because Indian industry fears the kind of policies AAP might pursue -- as things stand there is no question of Kejriwal being part of, let alone leading, the next government -- but because its emergence has queered the pitch for the BJP and its prime ministerial candidate, Narendra Modi. It is no secret that India's corporate sector is rooting for Modi in the hope that he will run a 'decisive, business-friendly' administration, one in which the trains will run on time. Business leaders such as Ambani, boss of Reliance Industries, and even Ratan Tata, patriarch of the multinational Tata Group, blame the Congress and its populism for the slowdown in the economy. But their hopes are pinned on the BJP winning a sizable number of seats and going on to form the government. Modi needs 272 MPs in a House of 543, and a sizable chunk of that will have to be from his own party if his government is to be reasonably stable. At the best of times, the federalized nature of Indian politics makes that goal a difficult one to achieve but this time the BJP has Kejriwal to contend as well. The AAP is expected to put up a decent fight in the 200 urban and semi-urban constituencies that Modi needs to win if he wants to become Prime Minister. And in at least 50 seats, the AAP could either win outright or take away substantial anti-Congress votes from the BJP. As the election campaign gets underway, the BJP will probably find itself devoting more time and energy to countering the Kejriwal party's challenge, especially in those states which have hitherto seen two-party contests between the Congress and the BJP. It is hardly surprising, therefore, that the BJP's attacks on Kejriwal and the AAP have sharpened in recent weeks.